This salad is perfect for a night in, special company, or just wanting to impress in laws with a fancy but not-so-fancy salad. 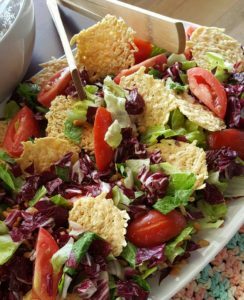 The parmesan crisps make this salad very interesting and different. Bonus: no anchovies in the salad dressing! Most Caesar salad dressing is made with anchovies, this one uses capers. So enjoy! 1. Preheat oven to 400 degrees. Place 1 rounded heaping tablespoon of Parmesan on a silicone or parchment lined baking sheet and lightly pat down into a circle. Repeat with the remaining cheese, spacing the 6 tablespoons about a 1/2 inch apart. Bake for 5-6 minutes or until golden and crisp. Allow to cool before removing from the baking sheet. 1. Place all ingredients in a blender and blend until smooth. Set aside. Makes 9 tablespoons.